If Miss Marple had peeked out from behind one of the palms in the Royal Lounge I doubt anyone would have batted an eyelid. Such is the cameo of Edwardian noblesse oblige that overflows aboard Royal Crown. 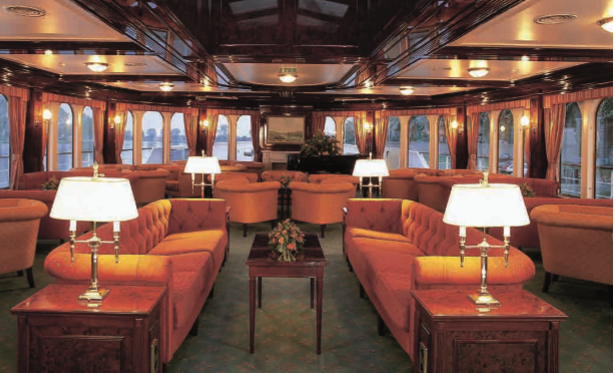 The anachronistic river cruise ship is unlike any other and offers a milieu that harks back to the genteel pastimes of yesteryear. 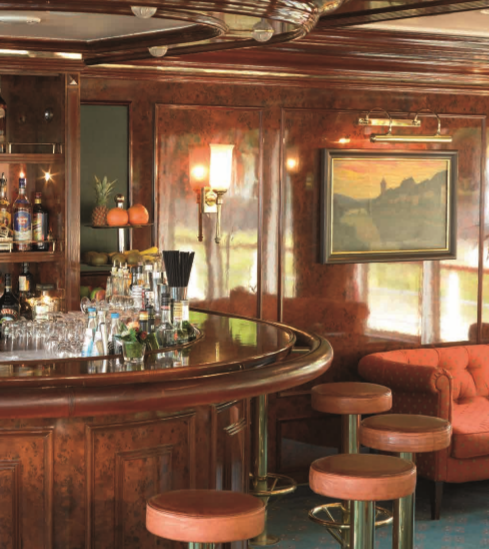 Think Orient Express style of décor and decorum and you’re getting close. The current vogue in river cruise vessel construction is all about bragging rights with über-cool design innovations in marine architecture defying the operational constraints that ships face while navigating Europe’s complex rivers, canals and locks. Royal Crown offersa more sedate vibe – one I came to appreciate for its subtle alchemy of Thirtiesglamour and modern élan. Built in 1996 as River Cloud I by the Grave Shipyard in Holland for Sea Cloud Cruises GmbH of Hamburg, it was conceived in the style of the luxurious sailing ships operated by the company. In 2010 the vessel was acquired by the Neerlandic Shipping Group – a Dutch-based company with a portfolio of 17 tanker ships. 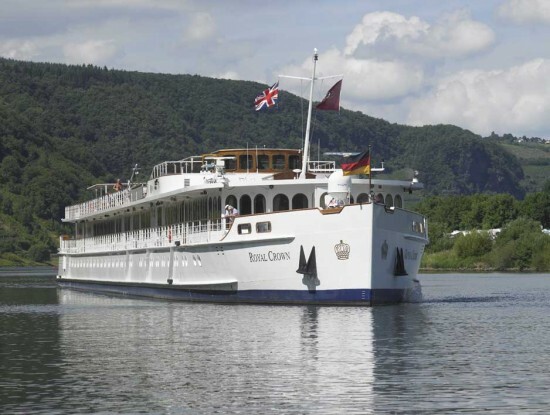 It has been the sole operator of the Hamburg-registered Royal Crown since 2012. Hebridean Island Cruises, and Titan. 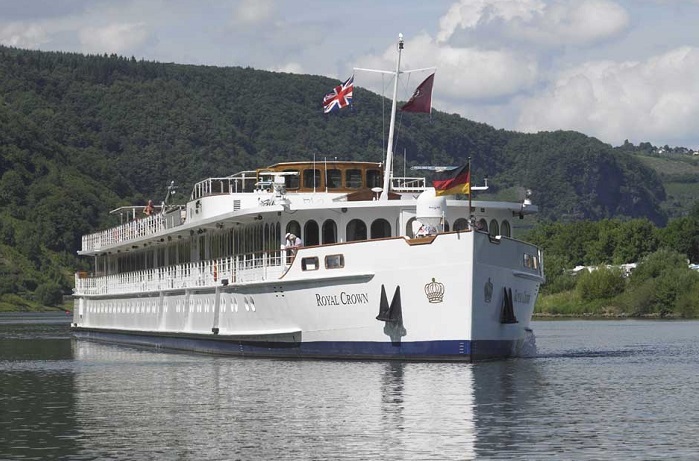 A highlight of the extensive series of Noble Caledonia charters in 2015 is a 23-night ‘Across Europe by River’ travelling more than 2,200 miles from Amsterdam to the Black Sea. This sailing heads along the Rhine, Main and Danube, undertaking a navigation that was conceived by Charlemagne more than 1,200 years ago. When Royal Crown is chartered by Hebridean Island Cruises the company creates a semblance of the experience guests enjoy aboard the perennially-popular Hebridean Princess. Personnel such as Pursers David Indge or Charles Carroll; Cruise Director Sheila Salmon; as well as pianist Will Marshall from the former Hebridean Spirit; not to mention a familiar crew member or two, accompany these departures. Familiar touches such as ‘Piping the Haggis’ during the farewell gala dinner ensure familiarity is a key element of these river cruise programmes which areinclusive of tours, wines and gratuities. On my cruise we left the bustle of Amsterdam in our wake and as we set sail into the Dutch hinterland I realised that river cruising is the most effortless way to travel. No other mode of transport allows you to slip so silently, so unobtrusively, through natural tableaux. At Hoorn, whose role for the Dutch East India Company is reflected in the quaint buildings, it was a revelation to learn that Chile’s Cape Horn was originally given the name ‘Kaap Hoorn’ – in honour of this Dutch city. Touring the Zuiderzee Museum in Enkhuizen we saw what life was like before the Afsluitdijk (IJsselmeer Barrier Dam) transformed the sea into the Ijsselmeer (one of the largest inland freshwater lakes in Holland) in 1932. Volendam’s history is preserved in art, literature and music of this waterfront town. From here we took an excursion to Zaanse Schans, an open-air museum with typical 17th and 18th century houses and windmills still in perfect working order. Lined up in two opposing rows, the 19 pristinely preserved windmills at Kinderdijk were erected in the 1600s to drain the flood-prone Alblasserwaard polders. In this UNESCO World Heritage Site we also saw how dykes, reservoirs and pumping stations play a vital role in Holland’s water management. The real joy though, was floating through the pastoral landscapes at a medieval pace. All around us, meadows winnowed with wild flowers interspersed with canals hazily reflecting the tall poplars lining their banks offered an evocative scene. The meandering waterways were like a slow-running commentary to a bucolic scene of villages and hamlets which open up to river cruise ships in a demeanour impossible to experience by road and car. Anyone who has experienced this holiday type is under no illusion that river cruising offers the ultimate in effortless Europe. “What makes a river so restful to people is that it doesn’t have any doubt. It is sure to get where it is going and it doesn’t want to go anywhere else.” This observation by Pulitzer Prize winning journalist Hal Boyle was never far from my mind aboard Royal Crown – itself brim-full of doubtless charm. During my exploration of this vessel that’s not so much faked as well edited, I had an epiphany. Strolling along the wide mahogany-panelled corridor from the rosewood-clad saloon that is the Dining Room to the central stairwell that descends from the reception area towards the main accommodation deck, I could have been aboard the legendary Cunard liner Aquitania – renowned in the 1930s as the ‘ship beautiful’. The all-consuming aura is akin to a grand European hotel. Small details such as metal cabin keys rather than plastic key-cards; an ornamental fireplace and baby grand piano in the Royal Lounge; teak deck furniture and traditional sun-loungers; as well as a putting green on the Sun Deck enhance the mood of a vessel that rekindles the values of yesteryear. There are three grades of accommodation. The six Royal Suites on Panorama Deck have burr-walnut panelling throughout; twin beds have cosy duvets; there’s ample wardrobe space; large central dresser with mirrors; flat-screen television and refrigerator. Two large floor-to-ceiling windows have Venetian blinds and there’s a lounge area with sofa and table. The bathrooms (identical in all grades) are large for a river cruise ship and come with a generous glass-enclosed shower. Four Premium Suites are located on Cabin Deck as are 35 Deluxe Suites; these have portholes rather than windows and have differing bed layouts. Unlike latter-day vessels there are no private balconies. The Dining Room with tables for six and eight has floor-to-ceiling windows. A well-stocked central buffet has plethora of breakfast and lunch choices while dinner is served by the courteous waiting staff. One night I savoured an Amuse Bouche of Melon Mint Shot with Crispy Bacon; Tomato and Mozzarella Caprese; French Onion Soup; Roasted Duck Breast with Grand Marnier Sauce, Red Cabbage and Williams Potatoes; rounded off with a Coconut Parfait with Pineapple Mint Confit. We enjoyed a Riesling Schiefer Steillege from Germany at €26 a bottle. As the late afternoon sun raked across villages silhouetted against a rose-coloured sky we sipped cocktails on deck where G&Ts were a reasonable €5 and a half-litre of Veltins draught beer a refreshing €3.80. After-dinner entertainment was in the Royal Lounge where pianist Sunny entertained, some guests even took advantage of the small dance floor while others chose to sit at the convivial semi-circular bar and quaff the crisp house wine at €3.50 or single malts for €8.50. There’s also a gift shop and library on Panorama Deck as well as a fitness centre and dry sauna. This all-too-short voyage through the river and canal network that is an integral part of the Dutch topography certainly whetted my appetite for a longer voyage which features in summer and autumn itineraries. However it offered a pitch-perfect showcase to the inimitable Royal Crown.